While growing up on a farm near Harmony, Arvin Vander Plas was driving tractors at age 6 and rebuilding a John Deere 40 at age 10. 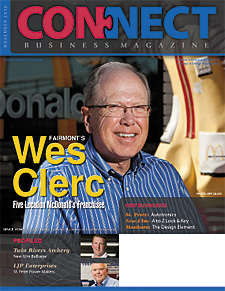 Fairmont resident Wes Clerc (pronounced Clair) serves up more than French fries and Angus Deluxe burgers. Yes, he and son Rick own and operate five thriving McDonald’s franchises in Fairmont, Blue Earth, St. James, Windom, and Marshall. And yes, 60-year-old Clerc over the last 44 years has been thoroughly batter-dipped and deep-fried in McDonald’s elbow grease, having worked his way up Ronald McDonald’s corporate ladder from being a 16-year-old crew worker to senior business consultant to franchisee. At this reading, the Editor could still be pumping water out his basement sump pump from the late September aqua deluge. It was Noah’s Ark in Vernon Center—along with everywhere else. As for this election: Be sure to vote your conscience and become part of a human deluge at the November polls. 80-employee St. Peter solid waste and recycling services company offers profitable alternatives to landfill dumping. In writing To A Mouse, eighteenth century Scots poet Robert Burns penned, “The best laid schemes o’ mice an’ men gang aft agley.” Perhaps a modern version of expressing this oft-quoted line: A person’s best plans often become fouled up. And such was Larry Biederman in 1974. Last issue, I complained about being snubbed by the host of the June hail storm which created a cash feast for building contractors and auto body repair shops. Then in the midst of cursing the endless rain of September, it dawned on me that Mother Nature has been implementing her own economic stimulus package. Around 10 a.m. on the first Tuesday in September, Mitch Lewis settled back in the chair behind his desk and said he had most of the day for a Connect Business Magazine interview, at least until 3:00 p.m. At that time, he had to be home because his children, Carson and Brooklyn, would be out of school, and wife, Maria, was traveling on business.